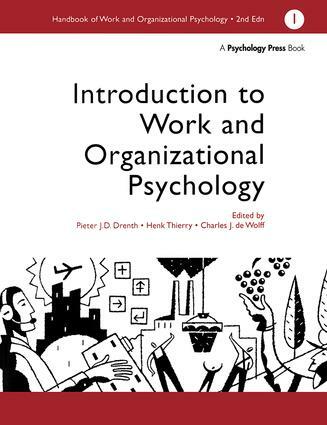 The introductory volume of the Handbook of Work and Organizational Psychology is concerned with definitional, historical and methodological fundamentals. It explores the nature of studies in work and organizational psychology; the role played by the professional psychologist; and the ways in which the discipline has developed within Europe. The editors attempt to characterize the domain of work and organizational psychology, and examine relations between this and other subdisciplines within psychology, as well as those disciplines outside psychology also concerned with work and organization. P.J.D. Drenth, H. Thierry, C.J. de Wolff, 1. What is Work and Organizational Psychology? The Domain of Work and Organizational Psychology. Work and Organizational Psychology as a Discipline. Work and Organizational Psychology: Pure Scientific Research and Applied Research. Future Topics for Work and Organizational Psychology. The Organization of this Handbook. References. P.J.D. Drenth, 2. Research in Work and Organizational Psychology: Principles and Methods. Introduction. Characteristics of a Scientific Line of Thought. Types of Research. Science and Application. The Scientific Interpretation Process: Special Problems. Differences in Research Design. Methods of Data Collection. Acknowledgements. References. C.J. de Wolff, 3. The Role of the Work and Organizational Psychologist. Introduction. The Profession of Psychologist. The Domain. Who is the Client? Mangaging the Profession. The Training of the Work and Organizational Psychologist. The Professional Association. Relationship With Other Disciplines. The Relationship With the Government. The Future of the Work and Organizational Psychology Profession. References. S. Shimmin, P.J. van Strien, 4. History of the Psychology of Work and Organization. Introduction. Establishing the Profession. Post-war Expansion and Consolidation. New Directions and Reorientation. Later Developments. The Dynamics of History. References. Author Index. Subject Index.